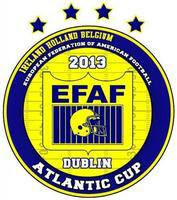 There is no domestic Irish football this weekend but two Irish teams take part in the EFAF Atlantic Cup! We interviewed David Barker of Trinity College Dublin and Belfast Trojans' Head Coach, Drew Mikhael, but now we take a look at the teams themselves. The Trojans have stormed the Shamrock Bowl North conference, going 8&0, and scoring a massive 292 points whilst conceding only 38. They will be attempting to recreate such dominance against the European competition come this afternoon. They take on The Netherlands' Amersfoort Untouchables in a match with a lot of unknown quantities. The Trojans have never played in a European game and will have had little, if any, chance to see their opponents play. As Drew Mikhael said in our interview they will have to look inwards and concentrate on their own game and fundamentals. The Trojans' offensive line will be key and give their fearsome running backs, including Double Coverage SBC MVP David Colvin, chance to shine. Quarterback James McKelvey will be key to leading the offence and calling out defensive plays. On defence the Irish side will be looking to dominate at the line of scrimmage whilst racking up the tackles. The Trojans will have to keep a keen eye on the air attack too, as they will more than likely see many more passes than they are used to against such European opposition. The Belfast side has a real chance of winning the Atlantic Cup if they continue the form they have been in all season. We'll see over the two days. Due to the disruptions of the SBC South, it's been over a month since TCD played a game, and that was a game they will want to have forgotten in a hurry. They were pummelled by cross-city rivals University College Dublin in the "Colours Derby". 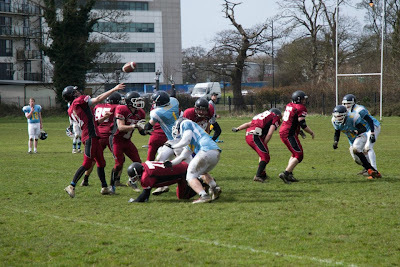 However they still managed to wrap up the division title, with an impressive double win over the University of Limerick Vikings. As such they were invited to the Atlantic Cup and were drafted to play against Belgium's Brussels Tigers. Again they will be heading in to the great unknown, with very little knowledge on their opponents, and as such will have to focus on their own game. With injured and missing players back since that defeat against UCD, Trinity may fancy their chances in their first European game. Quarterback Alex Gurnee will be key for TCD, and will be able to hurt the Tigers through the air and along the ground. However it will be running back Rob McDowell, amongst the best in the Shamrock Bowl Conference, that will be handed the ball most often and be relied on to put points on the board. On defence it will be safety Andrew Redmond, the only true defensive Double Coverage MVP nominee, that will be looked to to mop up the Tigers' offence and the defensive line will have to be on top of their game to deal with run game of Brussels.